Jalandhar: Creating the biggest competitive platform for talented students of India, Lovely Professional University raised curtain for three-day National Open Fest- “YOUTH VIBE- 2013”, today, at its campus. On the first day, enormous participation from 150 universities and colleges across India heightened the participating fervour among students for 35 diverse competitions. 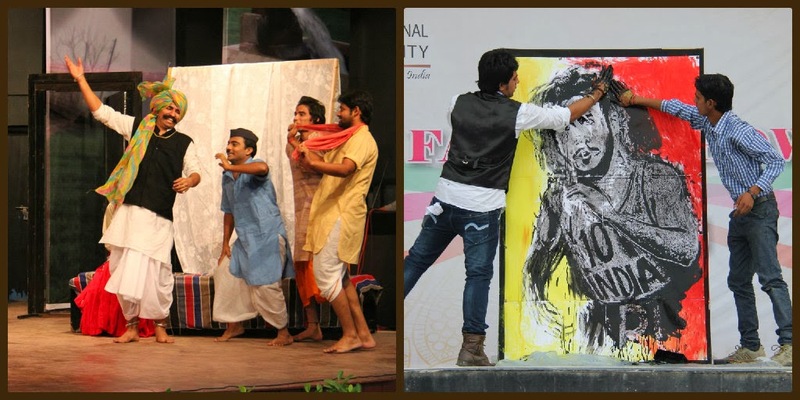 Students exhibited their best in light vocal singing, stage plays, technical events like bridge Construction, film making, dress designing & literary events. Epic gathering of students had lifetime experience by participating in or witnessing the neck to neck competitions. Each event saw a heightened competition as, in addition to a national level participation frame, prizes worth Rs 18 Lakh are also to be won. The evening was also as excited as the whole day remained. The university crowd swung to the performances by MTV Roadies fame actor Raghu Ram, Saubhagyavati Bhav and Jhalak Dikhla Ja serials fame actor/dancer Karanvir Bohra, Composer & Singer Harry Anand, V-Channel VJ and actress Teejay Sidhu, and “har ek friend jaroori hota hae” song fame Aditi Singh. This specially invited galaxy of youthful stars entertained students to the core. While shaking a leg with students to entertain them, anchor & producer of TV reality shows Raghu Ram shared tips on success and life with them. Feeling very happy to be a great part of LPU Fest, he interacted with students: "The real success follows when you dedicate yourself to your ambitions. Youth has to take the baton in their hands, and it is high time we understand that being passive does not help." He also discussed with them about the truth behind reality shows. Next day competitions will be for Choreography, Quiz rounds, Rock band show, Classical & Duet dances, rap-singing, news reading, Photography, Street plays, Robo-Wars, Robotics, Rocket Designing,Software based architectural designing, 3D model designing, Drawing 360 degree view, Programming, algorithm designing, Chemical Based Cars, Business Plan etc.